Guest post by Harold Thompson of Surf Cafe. Your trash could give away your stockpiles. Accurate news will be hard to come by. You will have very little time to bug out, unnoticed. You must have a plan with multiple backup contingencies. If there is economic collapse beware the Government takeover fix. If you have to leave your home, where will you go and what will you come back to? If things do turn around will you have anything to start over with? Do you have a cache to store your valuables and is that viable? If you require special medical attention it may be under Government supervision. You might be safer in a group than trying to go it alone. Pros and Cons either way. The unscrupulous of society will exploit the situation to the maximum extent. Don’t think you will be able to kill a rabbit and read up on your Kindle™ what do next. Gear without training is useless. Start training yourself NOW. The more you can do without, the less you will have to “carry”. Take an alternative approach to food/diet and learn to prepare those foods. Train by doing something everyday in a “survival mode”. Exercise your Second Amendment rights while you still can. And train to use those arms. Having the ten dollar version of a tool is better than no tool at all. 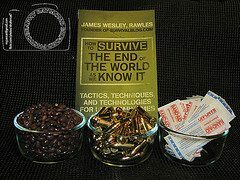 Read the survival blogs, watch YouTube and download what you can. Keep an admin pouch with all pertinent documents and survival how-to instructions. Assuming electronics are still viable, make backups of all critical data, photos etc. Don’t give in to fear or panic; the more prepared you are the better your chances to survive. Take the previous 24 items not as slogans but think of the implications of each one.